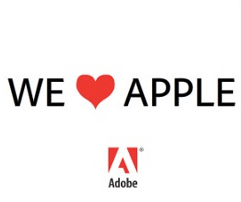 Adobe Counters Apple's Hate With Love and "Openness"
Adobe has responded to Apple CEO Steve Jobs' thrashing of Adobe and Flash with an ad campaign that says "We [Heart] Apple". This ads leads to a statement from Adobe and an open letter from Adobe founders Chuck Geschke and John Warnock. In the statement Adobe says that they support an open market and that they are about all openness, a direct response to Steve Jobs' comment that Adobe is a closed system. In the statement Adobe talks about allowing developers, publishers and consumers to make the choices. Openness is at Adobe's core. Our first technology was an open standard that liberated publishing from proprietary printing systems, and soon afterward our PDF technology eliminated barriers to sharing documents across platforms. We believe open markets that allow developers, publishers, and consumers to make their own choices about how they create, distribute, and access content are essential to progress. That's why we actively support technologies like HTML4, HTML5, CSS, and H.264, in addition to our own technologies. In their open letter, Adobe Co-founders Chuck Geschke and John Warnock said that by taking the opposite direction of their "open" system, they are potentially hurting creativity and impeding "the next chapter of the web". While it is an interesting reply from Adobe, one cannot help but wonder if Adobe is really as open as they are making themselves sound.